does this sound about rite?? what kind of gun do you have? you may have difficulties with the powder not wanting to cling on the second and third coats. if this is the case, you'll probably need to shoot them hot. basically, shoot first coat, bake for a few after it gels, pull it from the oven, wait til it cools to about 200-225, shoot second, put back in oven, bake for a few after it gels, repeat... definitely practice on the first rim. 4) remove the powder deflector cone so it's more of a direct pin-point than a gentle spray. for more details on shooting hot, search for "hot flocking"
do u recomend using a conventional oven? i am using a fire brick lined furnace, i build furnaces for a living so i have plenty of them i can use. do i heat up the wheel before applying the first coat ( undercoat ), or do i do this cold? i thought the fan end on the gun was there to stop any clumps of powder from happening, is it ok to remove this? You stated that you were under coating. Why? I only do that with Kl Primer or a black Epoxy and only on some stuff, but not on very much. Don't think I've heard of anybody undercoating aluminum wheels at all. And with your gun not having a KV control, you might be creating yourself a battle. Put your color on and clear it. Finished. will that be durable enough for alloy wheels? i'm with jtw. i'd shoot it your color and that's it, unless that powder specifically requires a top coat. make sure whatever powder you choose is UV- and weather-stable. 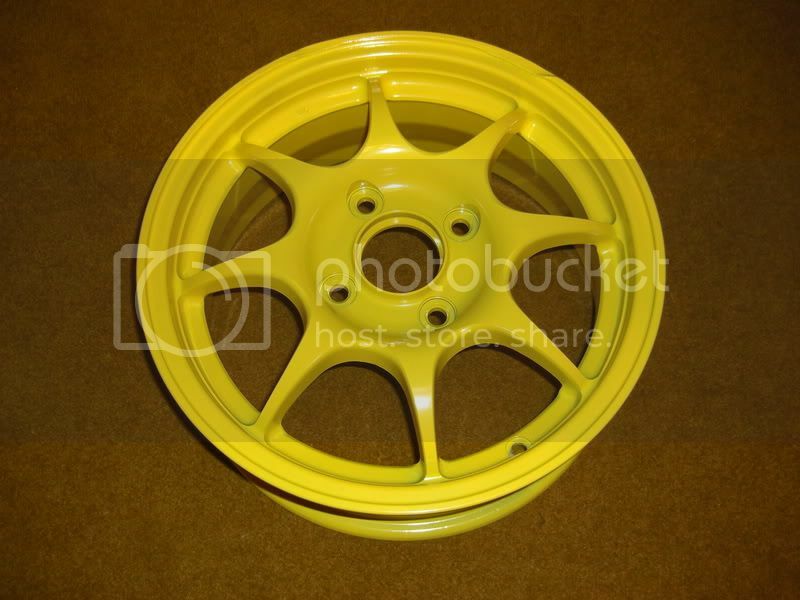 so if i shoot it with say gloss yellow for instance as i have plenty of that powder to try, that is not the colour i will be using tho but this is a damaged wheel that i have lying around, it has been profeshionaly sandblasted already, so i think ill bite the bullet and give it a go, just out off interest if i feel it needs another coat how do i go about doing that? shoot it when i leaves the oven rite away or let it cool abit first? If you are going to pull it from the oven and shoot it (called HOT FLOCKING), let it cool a bit to around 250* and don't over do it or you will get runs. just make sure it's coated good. If you shoot it hotter then that it will start to flow. I've done it both ways. Sometimes, with the hobby gun you have no other choice but to hot flock, cause it won't stick. I have the King Coat and I will do that, just speed things up a bit. But normally I shoot um cold. ok heres my attempt at my first wheel. What clear will do for the some one is give the Wheel/Yellow more protection and durability. Also when you spray the clear it will go on white. You will definitely know when you spray it on. By the way, the wheel looks good, so don't stop there. That looks great 4 the 1st attempt. did you heat the wheel before shooting it? what kind of PC system are you using? How big is that rim? the rim is a 15" size, i didnt heat the rim before shooting it, should i have?? ok so basically clear coating a rim is just a personal prefrence?? is the clear hard to shoot and wot is the proper way to shoot it after shooting the first colour?